TinyLoop won the #DefeatDayZeo hackathon in Cape Town. Despite Day Zero being pushed out from an earlier anticipated 12 April to 4 June, the City of Cape Town is still looking for tech solutions to keep the fateful day at bay. Helen Zille, premier of the Western Cape, recently attended the launch of Retief Krige's WaterLoo grey water bank solution and has committed to meet more local start-ups that are innovating to solve the city's water challenges. 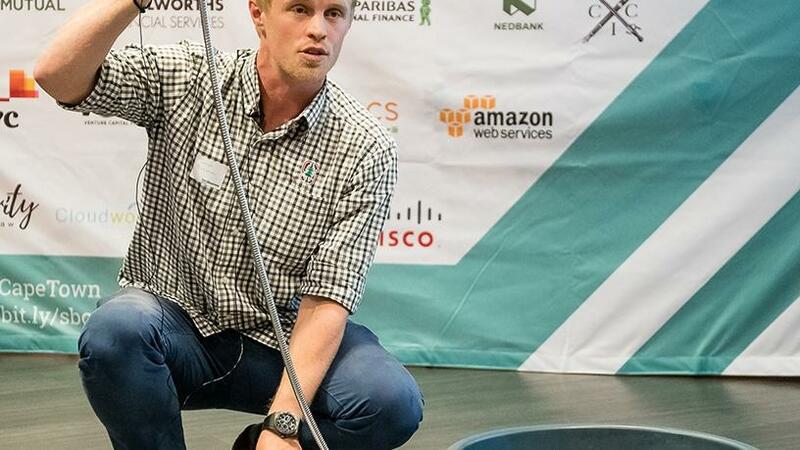 This week, Cape Town-based TinyEcos' innovation, the TinyLoop, was named winner of the H2O (Hack Two Day Zero) #DefeatDayZero hackathon held in the city. The TinyLoop team walked away with a corporate deal from crowdfunding platform Thundafund.com, as well as R20 000 in cash to help further product development. The hackathon - in partnership with consumer finance business RCS Group - attempts to find digital solutions that will push back Day Zero. TinyLoop head designer Thomas Bartleman says the innovation will enable users to shower for an unlimited time without exceeding the 50 litres per person limit. "It is a retrofit device that can be placed inside a shower or bathtub and allows the individual to reuse the same 10 litres of water for a shower for a long period while staying below the current level 6B water restrictions allocation of 50 litres per person. With a few upcoming modifications, it will become a pumping system that allows you to seamlessly transfer water between fixtures and appliances." He adds that through the competition, the firm is now in talks with relevant authorities to take the product to market. "Engaging with the Cape Town community and leadership is of utmost importance, since the product is intended for citizens. "At the same time, we need to bring the product to a point where we can start production as soon as reasonably possible. ThundaFund will also provide their expertise in the crowdfunding space to help us to get the product market-ready," explains Bartleman. One of the hackathon finalists was TapOff, which created an online platform that aims to inform, empower and 'gamify' residential water use so residents use 50 litres or less water per person per day. Meanwhile, the city is operating an online water map to assist in water usage tracking. Haroon Suliman, senior business solutions manager at SAS, says the use of advanced data analytics will aid the Western Cape government uncover patterns and anomalies in water usage and loss. "By using analytics, the municipality will easily be able to detect anomalies in a particular household's behaviour. Moreover, advanced analytics solutions are able to run these models and calculations continuously and automatically, and can alert the municipality to any problems in real-time. Furthermore, by using analytics to identify responsible users, government could potentially offer them some form of reward and this would increase the incentive to save water. "Such an approach might further encourage users to install sustainable systems such as grey water collection vessels for garden use, which would save them even more money and take more pressure off supply." Paul Nel, chief partnership officer and chief financial officer of Startupbootcamp Cape Town, says residents are keen to solve this crisis through technology. "There is no doubt that collectively, people who have a passion to solve real issues, make a difference. This weekend's hackathon was testimony to that. The participants came from a variety of backgrounds with different skills, but all had a desire to build real solutions."